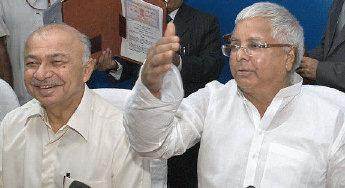 Gets Bhartiya Rail Bijlee rolling: The Union Minister for Power, Mr Sushil Kumar Shinde, and the Union Minister for Railways, Mr Lalu Prasad, during the signing of a joint venture agreement in the Capital on Tuesday. New Delhi, Nov 6 Indian Railways hopes to save Rs 400-600 crore annually by sourcing power from the 1,000 megawatt (MW) captive power unit to be set up at Nabinagar in Bihar. The project, which is targeted to be functional in four years, would bring in savings to Railways by providing cheaper power. The Railways and NTPC on Tuesday signed an agreement to enter into a joint venture for setting up the 1,000 MW power plant – Bhartiya Rail Bijlee Company Ltd. The project has been accorded mega-status and would enjoy fiscal benefits. “The average level cost of generation from this plant will be 213 paise per unit. After paying wheeling and transmission charges, it is expected that the Railways will pay about 338-363 paise per unit and save Rs 400-600 crore per annum,” said Mr K.C. Jena, Chairman, Railway Board, adding that this would reduce the operating expenses by 1-2 per cent. The average cost of electricity for Railways is 428 paise per unit. In 2006-07, Railways spent Rs 5,707 crore for consuming 13.3 billion units of electricity for traction and non-traction purposes. The Nabinagar power plant, to be built at a cost of Rs 5,352 crore, will also provide 10 per cent of generated power to other users. While NTPC would have an equity of 74 per cent (Rs 1,188 crore), Railways will have a 26 per cent (Rs 417 crore) equity. The project would be taken up on a 70:30 debt-equity basis. It would have an estimated annual coal consumption of five million tonnes and coal would be sourced from North Karanpura colliery, located 250 km from the site. The Union Power Minister, Mr Sushil Kumar Shinde, said that this joint venture will be mutually beneficial for both the Ministries of Railways and Power in view of the rising demand for power in the country. The joint venture agreement was signed by Mr Sudheer Kumar, Executive Director (Electrical Energy Management), Ministry of Railways and Mr R.S. Sharma, Director (Commercial), NTPC. Electricity from this plant, to be supplied through 164 traction substations, will be utilised by Indian Railways for running electric trains in Bihar, Jharkhand, West Bengal, Orissa, Chhattisgarh, Maharashtra, Gujarat and Madhya Pradesh. Speaking on the occasion, the Minister for Railways, Mr Lalu Prasad said that nearly 18,000 route km (out of more than 63,000 route km) of Indian Railways network, has already been electrified which constitutes 28 per cent of the total rail network carrying nearly 63 per cent of freight and 47.8 per cent of passenger traffic. The Railways stated that the Union Cabinet had, in view of the “unreasonably high tariff” charged by the State electricity boards (SEBs), approved Railways’ proposal for availing itself of direct power supply from Central generating agencies from the 15 per cent unallocated central share of power. Accordingly, the Railways availed itself of power supply from Dadri and Auriya power plant of NTPC in November 2000 for Ghaziabad-Kanpur section of Northern Railway. It is saving about Rs 50 crore per annum due to implementation of these schemes for availing direct power supply from NTPC/Central generating agencies.